As a scientist, I spend a lot of time thinking about how diet impacts our health and environment. I also love hanging out in the kitchen: I grew up cooking, baking, and gardening and spent years working in restaurants and catering. My mission? To bring together my passions for food, health, and sustainability to help you translate principles of sound nutrition and green eating to your plate through my science-based and food-loving philosophy of “Healthy Hedonism”. Forget boring vegetarian dishes and complete denial: there’s a better way to live and eat (and chocolate and martinis are definitely involved). 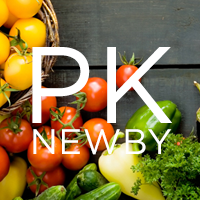 Here at "Cooking & Eating the PK Way" you’ll find recipes to help you lose weight, prevent disease, and live longer. But pleasure—that’s the “hedonism” part of the equation—is always at the center of the plate. After all, it doesn’t matter how good for you something is: if it’s not tasty, you’re not eating it—and neither am I! Live Your Healthiest Life, Deliciously. Scientists have understood the importance of diet in health and wellbeing for millennia in the Eastern world, but it’s taken the Western world a long time to catch on despite Hippocrates’ famous words to “let food be thy medicine” (c. 431 BC). Nutrition also gets a lot of bad press: “single study sensationalism” touting the findings from one experiment lacks the context of the broader scientific base; anti-science sentiments foment distrust in meaningful dietary recommendations; and most food bloggers doling out advice lack evidence to support their anecdotal claims. This makes it awfully difficult for people like you to wade through busy newsfeeds and hyped-up headlines to get to science-based, actionable steps to improve health and prevent disease. And, in a worst-case scenario, people lose faith in the scientific process, throw their hands up in the air, and order three pizzas. Instead, I encourage you to open your mind andexplore your palate through Cooking & Eating the PK Way. I challenge you to reconsider what what you think you know about “healthy food” and learn how incredible meals based on principles of sound nutrition science and sustainability can be. I promise you will be educated, if not entertained. (Food and science aren’t always funny. I try.) You may even salivate. My deepest hope is that you will be inspired to get into the kitchen and start your own culinary journey towards better health. And if cooking’s just not in the cards, then at the very least you’ll learn more about what to eat when you go to a restaurant or order take out. From farm to fork, what you eat matters.